There are four main ways to get stronger and lift heavier. They are: building more muscle, improving neural factors, improving technique, and desensitizing the protective mechanisms. People trying to build strength are working with two variables: exercise variety and frequency of max efforts. There are four combinations you can make. The first combination is minimal variety and frequent max efforts. This approach is all about specializing in a few lifts. To excel with it you’ll need joints of steel. The second combination is minimal variety and infrequent max efforts. With this approach you wouldn’t max out as often, so it would be good for longevity and technique mastery of a few key lifts. The third combination is high variety and frequent max efforts. This approach would not only help build strength, but also muscle mass, though it may not be the best for technical mastery. The fourth combination is high variety and infrequent max efforts. This approach would get you stronger but your ability to display it in a few specific lifts may not be as good as someone working with less variety. Strength is NOT lifting big weights on a few specific lifts. That’s a demonstration of strength. Strength is the capacity of your muscles to contract hard so that you can produce a high level of force. What you do with that strength – lift a big weight, battle an opponent, throw something far – is up to you. Build more muscle. The strength potential of a muscle is directly related to its cross-sectional area or size. That doesn’t mean a larger muscle is necessarily stronger, but it does mean that by making a muscle larger you increase its potential for strength. Muscle fiber recruitment, especially fast-twitch fibers. Muscle fiber firing rate.The faster the fibers “twitch” the more force they produce. It’s not just about how many fibers are recruited. Intra-muscular coordination, or how the muscle fibers work together. Inter-muscular coordination, or how well the various muscles involved in a movement work together. Become more technically efficient. Having better lifting technique doesn’t make the muscles stronger, but it makes it possible for you to make the best use of the strength you have and turn it into lifting performance. Desensitize the protective mechanisms. The Golgi Tendon Organs are “sensors” situated in the tendons that prevent excessive force production, preventing you from tearing yourself apart. When they sense that you’re producing too much force for your own good, they turn off force production. But this mechanism is very conservative. By desensitizing it you increase how much of your strength potential you can use. There are many different ways to train for strength. On one hand you have Olympic lifters who only use the competitive lifts and squats in their training. On the other end of the spectrum you have the Westside-influenced programs that use 80% assistance work and 20% big barbell lifts. Even within approaches that are similar in terms of exercises, you have widely different methods. All of these schools of thought work, but they work for different reasons and thus will be better suited to some and not for others. When you understand why something works it becomes much easier to decide how you should be training to maximize your results. There are four main ways to develop strength, and they can be combined to maximize your performance. Which way is best for you? That’s up to you to decide. Here’s what you’ll need to know to make that decision. The variety of exercises you use. You can use minimal variety or lots of variety. The frequency of max effort loading. You can work with weight close to your max very often, or you can work with maximum loading less often. So you have four combinations at your disposal for strength training. Here’s a closer look at their benefits and drawbacks. This approach is all about specificity. Not only do you concentrate on the lifts you’re targeting or competing in, but the level of effort at each session is similar to what you’ll have to do in a competition. The underlying principle is that you practice exactly like you compete. You thus become very good at that task – lifting maximum weights on a few select lifts. This can work only if you have a very solid technique, sufficient muscle mass, perfect proportions or body type for your lifts (so no glaring weak point), and a very high tolerance for high-load work. You also need joints of steel. This can be mentally draining so people with demanding jobs or stressful lifestyles need not apply. Honestly, very few people can train like this. But it can be used for a brief period (2-3 weeks) to peak strength in some specific lifts. Even then it would have to be followed by a deloading period to restore a proper CNS and physical working state. Think Norwegian powerlifting or Pavel’s “grease the groove” practice. Here you’d practice the same few lifts several times a week with very little (if any) assistance work. You would not max out as often as the Bulgarians would. Most of the work is done in the 70-85% range, which means going heavy maybe once a week or less. This approach works mostly through improvements in lifting technique as well as intra- and intermuscular coordination. It’ll make you very efficient at your selected lifts while keeping your nervous system fresh enough to perform at a high level. This is a very sustainable way to train over the long run. Provided that you practice with solid technique, it’ll make you very efficient at your selected lifts which will allow you to be able to use the strength you have efficiently. Since this approach doesn’t lend itself well to correcting weak links, it works best if you have no major weak area and already have sufficient muscle mass. Although you can build more mass with this approach than a high-frequency max effort approach, it’s still not a great way to train for maximum growth. For it to work optimally, you’d still have to touch some heavy weights (max effort method) from time to time, once every 1-2 weeks. Maybe not all-out effort, but certainly above 90% so that you can apply your solid technique under heavy conditions. Westside is more “middle of the road” when it comes to the amount of max effort work they actually do, but they still work up to a training max in half of their training sessions. While the proportion of lifts above 90% is low, they still come into the gym with a “maxing out” mentality twice a week – which is a lot more often than those who train max efforts infrequently. Because they rotate the exercises they max out on every 1 or 2 weeks, the stress on the nervous system is lower than if you always maxed out on the same lifts. This is a very good approach if you can stay with the correct number of maximum effort lifts per week (6 to 10). It can go bad really fast if you go even slightly above that. The high variation and significant amount of assistance work will help you build muscle mass in the right places, which makes it much easier to correct the weak links holding you back. So this approach is good both at making you strong overall as well as building muscle mass. The main drawback is that it might not make you super efficient technically since you aren’t practicing the actual competition lifts often or with enough volume. If you’re a competitor and you plan on competing in specific lifts, you need to practice them often. So while a large variety of exercises is great to build overall strength, it may not be the best way to be outstanding on a few select lifts. If you’ve got solid technique you won’t experience that drawback like someone who hasn’t yet built a foundation of technical mastery. Here the best example would be a traditional bodybuilding training program, but using lower reps and heavier weights (3-6 reps per set) on the big compound movements. It’s an approach that obviously allows you to build muscle mass because you can easily target the muscles you want to develop. You can also build decent overall strength by going heavier on the big lifts without necessarily using the max effort method. The main drawback? You may not develop the capacity to be really good at displaying your strength during a maximum effort on a specific lift. This is because you don’t practice each lift as much compared to other approaches, and also because you don’t use the maximum effort method (though you do go heavy). A 5 rep max weight won’t feel the same as a 1 rep max weight. Training for a 3, 4 or 5RM will make you stronger, but it will take some practice to become good at demonstrating it during a 1RM lift. It’s also an approach that lends itself to excess. Bodybuilding work is often not as mentally demanding as pure strength work, and because of that, we underestimate the impact it can have on the body. A lot of natural bodybuilders kill their muscle growth by doing too much volume. Start by using the minimal variety approach with moderate loading. Build a foundation and master perfect lifting technique on your selected lifts. Also use this period to diagnose weak areas that might limit your progress in the future. Train each of your selected lifts several times a week to work on technique and efficiency. Accumulate a lot of weekly work in the 70-85% range without draining the nervous system. Next do high variety with relatively frequent max/intense efforts. Correct weak links with the proper selection of assistance exercises. Increase your overall strength by using the max effort method weekly, staying at 3-5 max effort lifts in a workout, done twice a week. 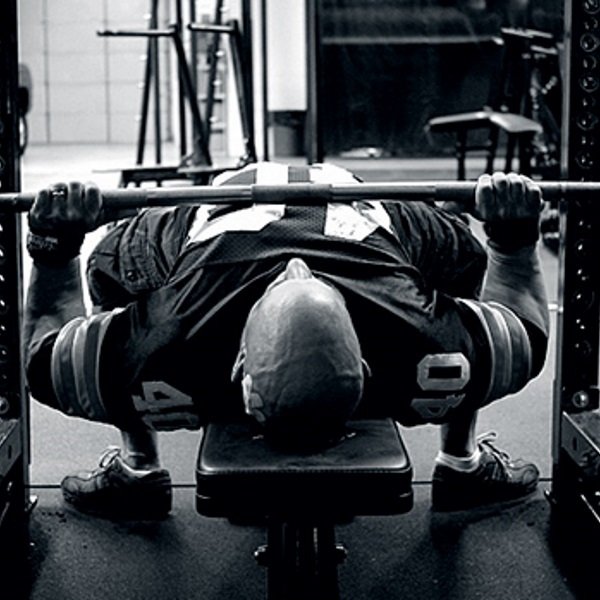 Vary the max effort exercise often to develop strength in as many different muscles and positions as possible. Westside is a good sample template to start with. Use the minimalist approach with frequent maximum effort loading. Learn to display your strength optimally on the actual competition or target lifts you’re trying to excel at. Get a boost in strength performance by maximizing muscle fiber recruitment, firing rate and intra/intermuscular coordination. But only do this for 2 or 3 weeks; any more than that and you’ll begin to go backward. Most people should stay at 2 weeks. Focus only on a few lifts (3) that you do frequently during the week (4-6 days per week), doing a max effort workout on half of these days. After your 2 or 3 weeks you should deload for 5-7 days prior to competing or testing yourself. Use high variety without any maximum effort sessions. The goal here is to let the nervous system recover, so avoid maximal work and avoid doing the competition or target lifts. Build the muscles that held you back during the competitive period. Focus your training on targeting your lagging areas. It’s also a good time to reduce the amount of lifting days in favor of GPP work, sprints, playing sports, etc.